A friend of mine got tired of her husband taking pictures on his 35mm camera, and developing 20 pictures of his thumb, and 4 pictures of what actually were passable photos of what he was shooting. To top it off, he always had double prints, and had a hard time throwing away the 40 prints of his thumb, because after all, he paid good money for the developing. For his Christmas gift that year, she bought him his first digital camera. He was thrilled! He took more pictures than ever before, and could delete the bad ones without the guilt of having paid good money for developing. And his wife was thrilled – no more pictures of her hubby’s thumbprint! The wife was going on a “weekend away” with her girlfriends. Her loving hubby said, “Why don’t you take my digital camera. I’m not going to be using it this weekend anyway. And here are some extra batteries so you don’t miss a single memory.” So off she goes for the weekend. She took some pretty fabulous, once-in-a-lifetime pictures of her friends having a great time and made memory books to share with her friends. My friend hints to her husband that she’d like to have a digital camera of her own, similar to the one that he has. My friend unwraps an early Christmas gift from her loving husband. To her amazement, it’s a very familiar looking digital camera. Yes, folks, the dashing stud that she married re-gifted to her the very same camera that she gave him last year for Christmas! You should have seen her reaction in the picture that he took on his new, better camera that he bought for himself. But he deleted it before he showed it to her. There is another well-known story about re-gifting that happened 2,000 years ago in a far-off city called Bethlehem. The story is about a young boy who heard the announcement of a king being born. 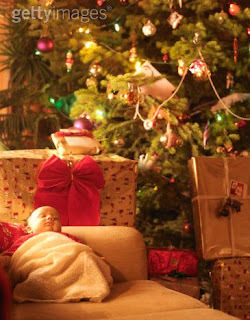 Everyone was bringing their best gifts to place before the baby, gifts fitting of someone born to royalty. But being just a lad himself, the young boy couldn’t afford to give the finer things that people usually give to a prince. The only gift he had was to share his talent of music. He picked up his drum and drumsticks, and went with the others to honor the baby. And he shared his talent with his greatest performance ever. In fact, his was the only gift that brought a smile of approval to face of the infant king. God gave so much to our lives. He gave us the baby Jesus, who grew up and gave his life for us. And by our accepting Jesus, we gained gifts through the Holy Spirit. I challenge everyone this Christmas season to re-gift to God what he gave to us. Discover and develop your God-given gifts, and use them for His glory to further the Kingdom of God.